The Dutchtown neighborhood, as defined by the City of St. Louis, is the most populous and one of the largest of the city’s 79 neighborhoods. However, that definition is quite fuzzy. 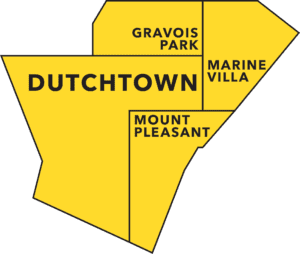 Signs around the neighborhood will tell you that “You Are In Dutchtown” when you are, in fact, in Gravois Park, Mount Pleasant, or Marine Villa. 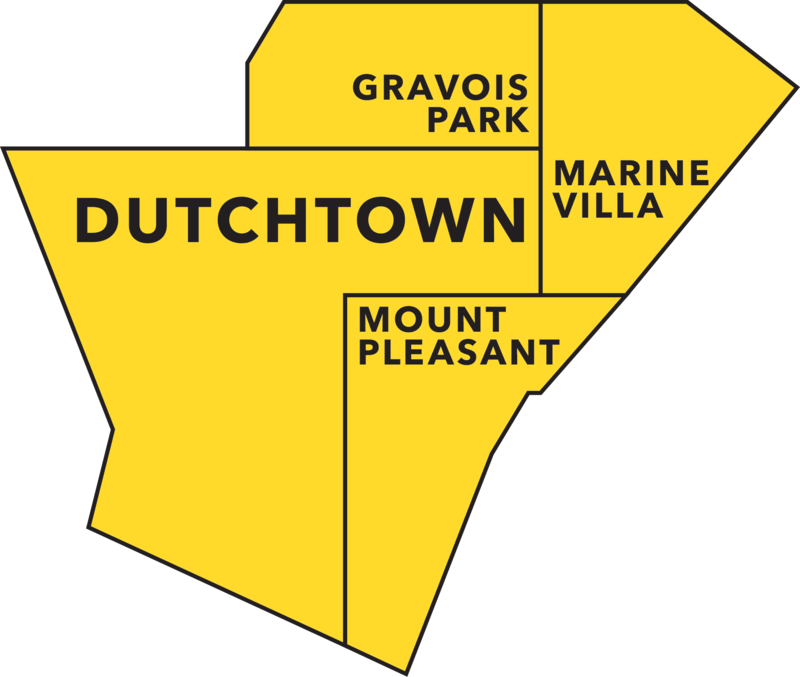 Here at DutchtownSTL.org, we approximate Dutchtown to be everything in between Cherokee Street or Chippewa Street to the north, Bates Street to the south, the Mississippi River to the east, and the Missouri Pacific railroad tracks to the west. 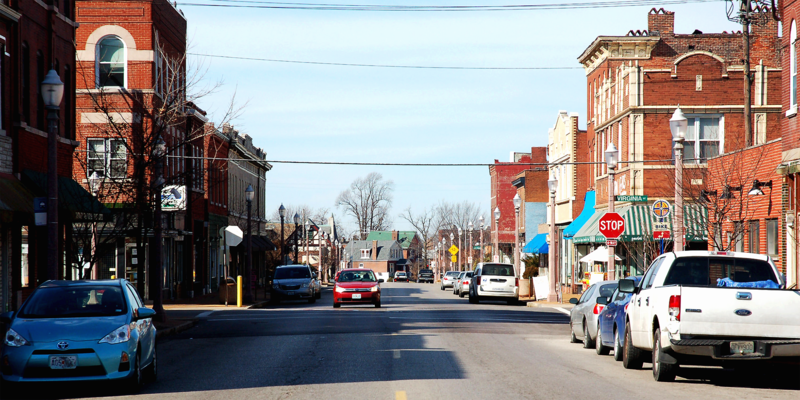 Meramec Street east of Grand Boulevard is referred to as “Downtown Dutchtown.” The neighborhood commercial strip features cafés and bars, resale shops, and other services. 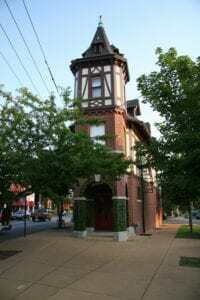 At Meramec and Virginia you can find some of the neighborhood’s strongest anchors: Winkelmann Sons Drug has been at the southwest corner since 1913. Urban Eats Café offers food, drink, and space for all kinds of community gatherings and enterprises. And Dutchtown South Community Corporation works to develop and stabilize the neighborhood and empower the surrounding community. 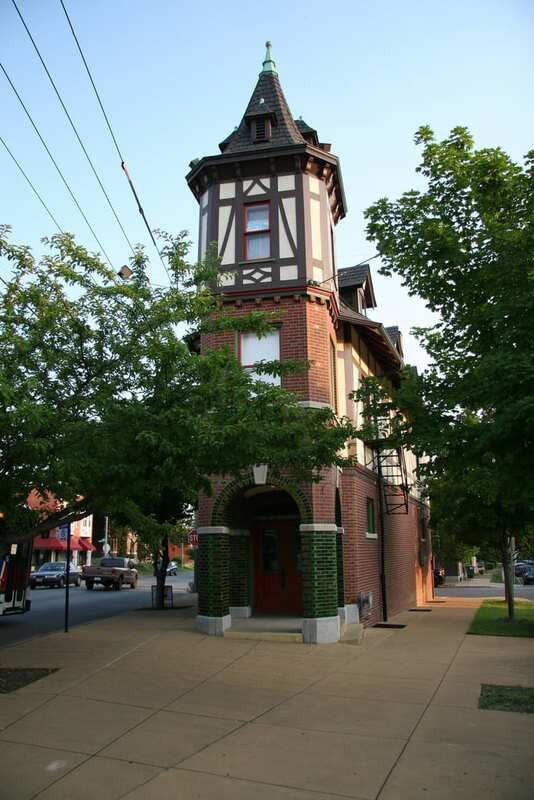 The historic Feasting Fox Restaurant serves as the western landmark on Meramec. At the eastern end is St. Anthony of Padua Catholic Church, whose towering twin steeples can be seen from all over the neighborhood. Cherokee Street has been a popular shopping and entertainment destination since the late nineteenth century. At that time, Cherokee hosted many department stores and theaters in addition to smaller specialty shops. Cherokee Antique Row between Jefferson and Lemp has long been a regional draw. Dozens of antique dealers, along with cafés, art studios, and other shops, line the eastern portion of Cherokee Street and bring antique hunters in from all overs. West of Jefferson, Cherokee Street has been reborn through investment from the Mexican-American community. Mexican grocery stores, taquerias, clothing stores, beauty parlors, and gift shops popped up west of Jefferson. Later, Cherokee attracted artists and bohemians seeking authentic and inexpensive city living. With them came art galleries, performance spaces, pizzerias, cocktail bars, and a brewery. Both cultures thrive side-by-side, and Cherokee Street is now a popular dining destination and nightlife spot. The main thoroughfares of Dutchtown. South Grand Boulevard features many businesses catering to the variety of immigrants that call Dutchtown home. Several Vietnamese restaurants, groceries, and coffee shops, along with the Gurung Bazaar serving the Nepali immigrant community, several small churches, and other shops and offices line South Grand. In addition to the evolving lineup of shops catering to the ever-changing community are businesses that have called Dutchtown home for decades: Merb’s Candies, famous for their Bionic Apples and chocolate-covered strawberries; the resurrected Feasting Fox Restaurant; and of course Ted Drewes Frozen Custard — Dutchtown’s little secret, featuring shorter lines and easier parking than the better-known St. Louis Hills location. Holding down the southern end of Grand since 1931 is St. Mary’s Catholic High School and their 27 acre campus. Recently Habitat for Humanity St. Louis renovated a long-vacant 50,000 square foot building at South Grand and Chippewa to serve as their headquarters, warehouse, and ReStore, an outlet offering new and reusable construction materials and tools. And soon, Garcia Properties plans to take on the Grandview Arcade Building, which had sat vacant for decades. Chippewa Street, the official boundary between Gravois Park and Dutchtown proper, has suffered from disinvestment in recent decades. 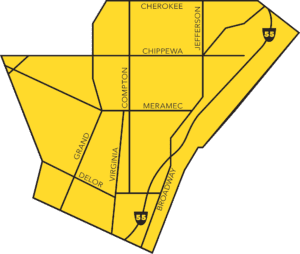 However, Rise Community Development and Lutheran Development Group’s $12 million Chippewa Park project aims to tackle vacancy and quality housing issues in the area by redeveloping fifteen buildings. The recently adopted Gravois-Jefferson Historic Neighborhoods Plan lays the groundwork for future development planning, with a special focus on the under-appreciated Chippewa Street. A wide assortment of businesses are based along South Broadway and South Jefferson, which merge at Chippewa Street. 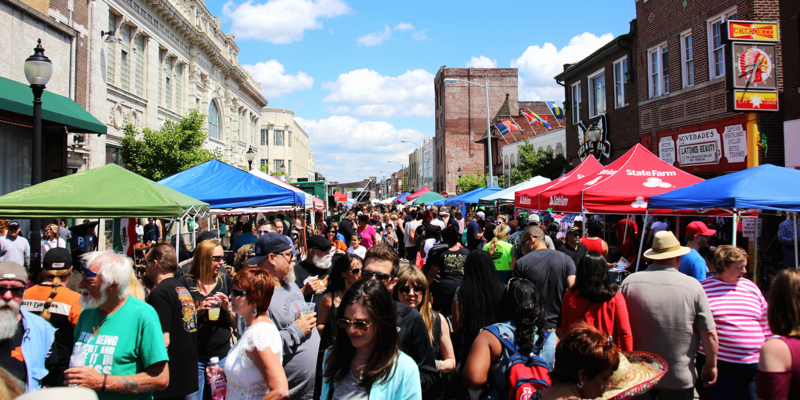 Liberty Hardware, Sump Coffee, and Don’s Meat Market are some of the small businesses along the strip. Concordia Publishing House has been in the area for over 150 years, as has St. Alexius Hospital, and the German Cultural Society also harkens back to the early settlers of the area. In the center of the neighborhood, straddling Compton Avenue, is Marquette Park. Marquette features the only free public pool on the South Side. The newly renovated Marquette Park Field House overlooks the neighborhood and provides a great space for meetings, receptions, and more. The park also has sports fields, tennis courts, and a playground. 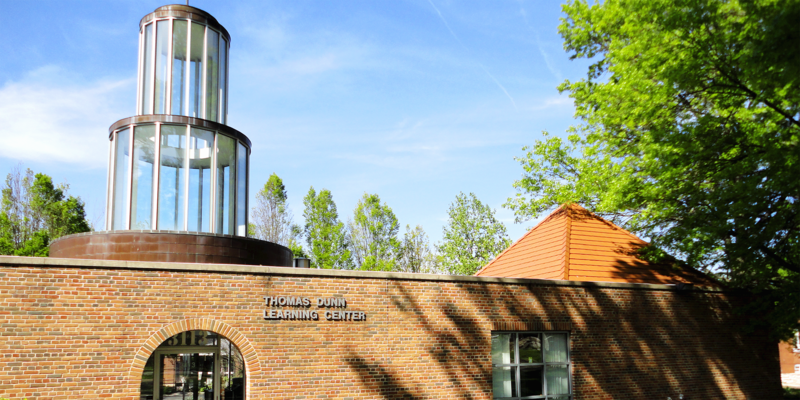 Thomas Dunn Learning Center stands at the southeast corner of Marquette Park at Minnesota and Gasconade. Thomas Dunn features a computer lab, an art studio, a demonstration kitchen, a library, a community garden, and multiple meeting spaces. In addition to hosting many public and private meetings and events, Thomas Dunn also offers open computer and art lab hours, HiSET (GED) classes, parenting education, financial counseling, youth summer camps, and much more. 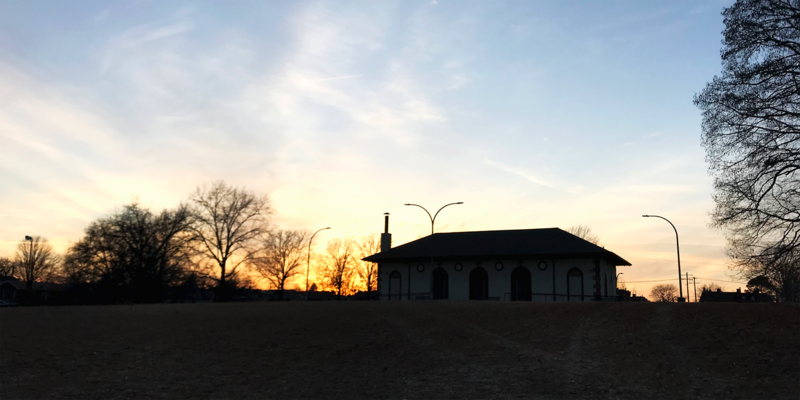 Due north of Marquette is Gravois Park, from which the surrounding neighborhood takes its name. 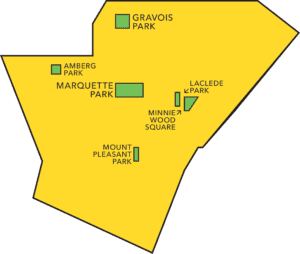 Gravois Park was established in 1812, and eventually the neighborhood grew up around it. The park features a beautiful pavilion at its center, and recently a new playground was built. 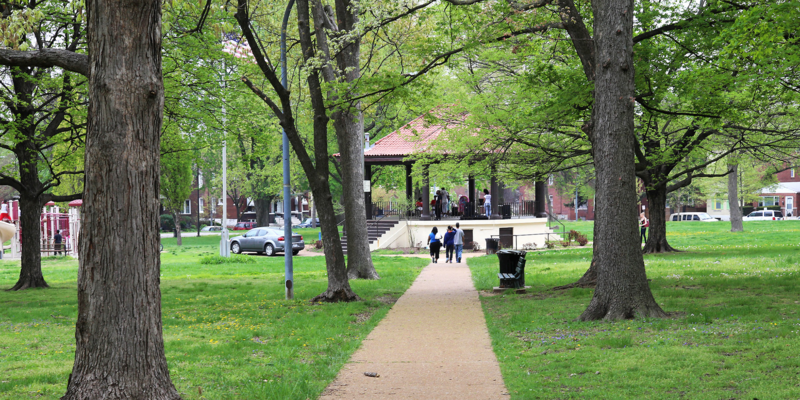 To the east, almost adjacent to each other, are Laclede Park and Minnie Wood Memorial Square. Minnie Wood Square, at South Broadway and Meramec, is distinguished by the bright yellow pavilion at that corner. The park also features several multi-purpose sports fields and a playground. Laclede Park, at Gasconade and Iowa, lacks the amenities of neighboring Minnie Wood, but does have the distinction of being established in 1812. Dutchtown South Community Corporation established their Friends of Pocket Parks project to rejuvenate the parks through community input. The Mount Pleasant neighborhood takes their name from Mount Pleasant Park at Michigan and Dakota. This pocket park features a roller hockey rink and a playground. Amberg Park is in the western section of Dutchtown, at Gustine, Keokuk, and Dunnica Avenues. 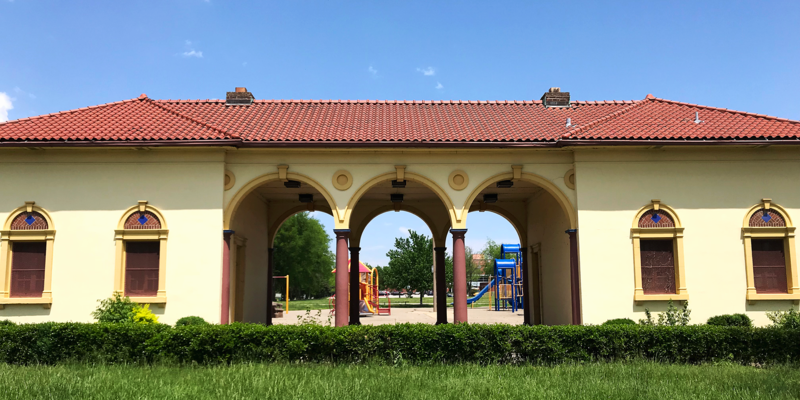 Baseball diamonds, a newer playground, and a renovated gazebo are some of the amenities at Amberg Park. The four neighborhoods that comprise Dutchtown have a total population of about 30,000 people. 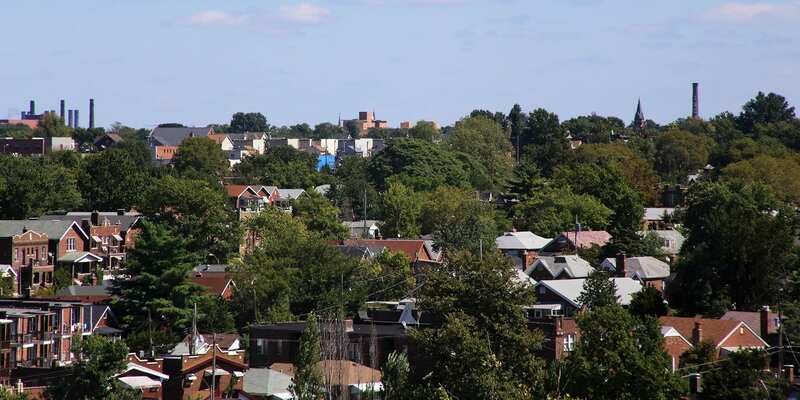 The Dutchtown area is among the most densely populated areas of St. Louis. Dutchtown is quite diverse. While largely black and white, there is a burgeoning Latinx population, a long-established Vietnamese community, and many other immigrants from across the globe. The population of Dutchtown is very young, with approximately a third of its residents under the age of 18. Homes are predominantly brick and range in variety with small shotgun workers’ cottages, modest bungalows, stately four-squares, and mansions on the bluffs of the Mississippi River. In addition to single-family homes, duplexes and four-family buildings are very common. Larger apartment buildings can be found sporadically through the neighborhood. The Stork Inn at Virginia and Idaho. Several buildings and neighborhoods are on the National Register of Historic Places. The Gravois-Jefferson Streetcar Suburb Historic District encompasses all of Gravois Park and the north end of Dutchtown. The St. Cecilia Historic District, especially notable for the heavy use of white-glazed “bakery brick” throughout the district, and the Dutchtown South Historic District cover most of the south end of Dutchtown. The Marine Villa Neighborhood Historic District covers a portion of Marine Villa. The sprawling National Candy Company Factory at the west end of the neighborhood is listed, as is the Stork Inn at Virginia and Idaho. Several schools designed by William B. Ittner appear on the register. Listed historic homes include the Miltenberger House on Osceola and the Chatillon De Menil House near the end of Antique Row. Other architectural standouts in the neighborhood include Catholic churches St. Anthony of Padua and St. Cecilia, the Lemp Brewery complex at the east end of Antique Row, and the Cinderella Building on Cherokee Street. The greater Dutchtown area falls mainly within three St. Louis aldermanic wards. 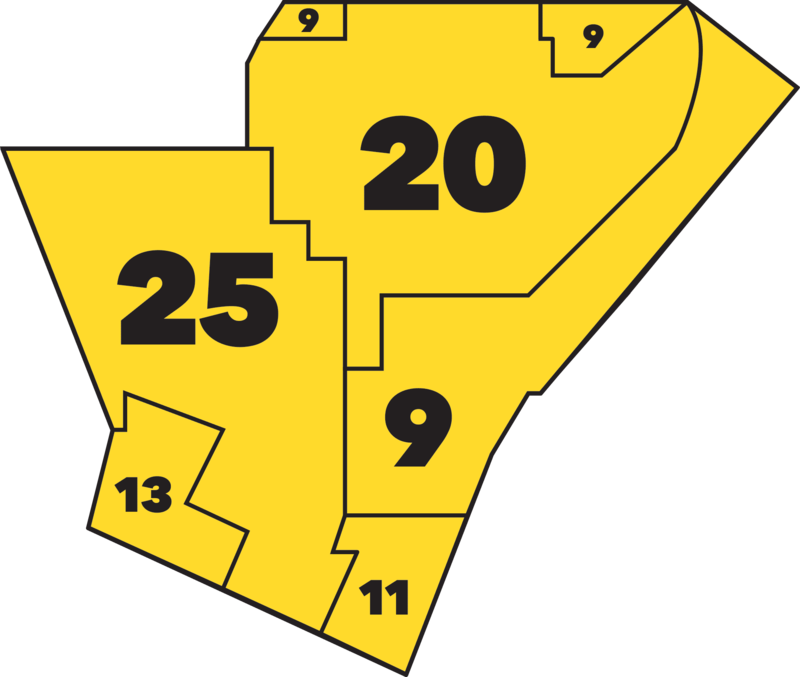 The western and southern portions, the 25th Ward, is represented by Ald. Shane Cohn. The 20th Ward covers the northern portion of the neighborhood and is represented by Ald. Cara Spencer. The unusually shaped 9th Ward, served by Ald. Dan Guenther, covers some ground to the north and to the south. Ald. Sarah Martin’s 11th Ward and Ald. Beth Murphy’s 13th Ward both cover small slivers of the south end of the neighborhood. Three Missouri House of Representatives districts cover Dutchtown. The 78th District, represented by Rep. Bruce Franks, covers the northwestern portion of the neighborhood. The 80th District, represented by Rep. Peter Meredith, includes the northwestern corner of Dutchtown. The southern portion of the neighborhood falls into the 81st District, currently represented by Rep. Steve Butz. All of the neighborhood lies within State Senate District 5, served by Sen. Jamilah Nasheed. At the federal level, Dutchtown is served by U.S. Rep. William Lacy Clay, U.S. Sen. Roy Blunt, and U.S. Sen. Josh Hawley. This page was last updated on January 17, 2019 .